has a nice ring to it, eh? Well, we're here to tell ya it has an absolutely fantastic ring to it and we're so very excited to let everyone know Happy Travelers Tours has been written up in Forbes and we're SHOUTING the news! When you're visiting the San Francisco Bay Area and you're looking for something to do besides the Sonoma Wine Tours or the Napa Wine Tours then you need to check out the Bay Area wine and weed tours which are running in Northern California. Whether you want to try infused wine or cannabis infused foods or prefer a more traditional wine tour, the cannabis scene in Northern California is worth exploring. Not every Cannabis Tour is a party bus, in fact, there are many events you can attend, ranging from puff-and-paint events to cannabis cooking lessons. If wine tastings are your thing, we recommend Happy Travelers Tours and the “Wine-and-Weed Only” Tour, which explores the convergence of wine and weed in Napa and Sonoma Counties. Or, if you're looking for something more Romantic, we recommend the "Sip-and-Sniff" Sunset Tour, which heads from Santa Rosa through the West Sonoma County hills to reach the beautiful Sonoma Coast and famous Bodega Head. You can taste wine and explore cannabis all in the comfort of a fully appointed limousine style bus, watch the sun set and then head back in time for dinner. Other cannabis experiences you can enjoy include things like visiting a Cannabis Grow, or even a commercial Farm, we've even heard of Weddings in the Grow! Whatever your interest is in California Cannabis Tours you should check out the activities in the Oakland and San Francisco Bay Area, as well as up in Napa and Sonoma Wine Country, or, should we say: Wine-and-Weed Country! See you soon on a Happy Travelers Tour! Do you Love tasting different craft beers/wines? If you are a regular in Napa/Sonoma or come to Napa/Sonoma specifically for wine/beer tasting and you're interested in something different, try a Weed Vacation Package. While you're in town, you can try something new, experiment with and learn about cannabis culture in California! What makes a Weed Vacation Package work? Destination, location and activities! First, set your GPS for Northern California's 'Wine and Weed' Country: Napa and Sonoma Counties. Second, check yourself into a 420 friendly Hotel or Bed-and-Breakfast and then, third, Book a Tour with the best of the Sonoma weed tours ... Happy Travelers Tours! For hotels in Sonoma, consider The Cottage Inn and Spa in the heart of the City of Sonoma, or, if you prefer a larger resort, check into the Sonoma Mission Inn and Spa, which is right down the street! If you're staying in Napa, you might want to visit The Archer Hotel, which is right in downtown Napa in the middle of all the action! Now, if you're visiting Santa Rosa, we suggest either the Hyatt Santa Rosa or, if you're budget consious, The Hampton Inn. “Wine-and-Weed Only” Tour where you visit a mountain top cannabis grow and get close to 1,200 plants, attend 'Cannabis Camp' and participate in our “Trimmigrant Experience" to learn what it takes to make a living in the cannabis industry, participate in our Sip-and-Sniff Experience and taste wine and cannabis, have lunch and enjoy a presentation by our Master Grower. “Destination: Grow” Tour where you spend the night at a 12 acre Cannabis Farm after having an amazing BBQ dinner. The next day, it's Lunch in Yountville and Wine Tasting at Two Premium Napa Valley Wineries … while smoking and vaping Cannabis on the way! And, Ladies, so you know: you can get Married in the Grow! The Happy Travelers Tours "Wine-and-Weed" Tour™ takes our Guests on an exploration of the convergence of Vineyards and Cannabis. On this unique Tour, we will taste and sample wine and cannabis, get your hands on marijuana (and help you try to roll a "joint"), enjoy a pizza lunch and visit two different Premium Wineries in the Valley of the Moon. Taste Wine! Sample Cannabis! Enjoy the Scenic Beauty of Northern California's Wine-and-Weed Country and become a Happy Traveler! Brewery Tours and Weed – What a Combination! Per our good friends at Yelp, there are at least 53 Breweries, Brew Pubs or Micro Breweries in Sonoma County, Napa County and Marin County. 53 places where Beer is King. Which means Marijuana is Queen! And it means Brewery Tours, along with Wine Tours, are a thing! Sonoma County Beer is a rising star on the North Coast with breweries from Lagunitas to Russian River Brewing Company being a couple of notables. So, what happens when a bunch of folks have been drinking beer on a beautiful Sonoma County day? Well, if they're like so many people we know, they step 'outside' and have a smoke. And, sometimes they're smoking weed. Stoned? You bet. Whether it was all the good Pale Ale or the outstanding Indica (or Sativa), an afternoon of touring Breweries often ends up with people being stoned, so, what happens then? Beer, Food and Weed – the perfect trifecta! What could be better than an afternoon filled with drinking good brews, eating great food and enjoying a hit or two of Sonoma County's finest locally grown ganja. So, how do you enjoy all this safely? Get yourself on a Tour! Beer, Wine and Weed tours are available through Happy Travelers Tours. To take a #HTTTour just give us a call! 707-386-9859. Or Book Now! Do you want to know more about recreational (or medical) marijuana but don't know what questions to ask or who to talk to? Do you have questions about: smoking, vaping, eating, drinking or applying weed or CBD? Are you visiting (or do you live in) California? Join Happy Travelers Tours as we explore California's Track and Trace system with on of our Educational Tours! We review three key nodes of the state's system: Cultivation, Manufacturing and Retail all in one Tour! Our Guests get their Cannabis questions answered by experts, and, when the day is done, you'll be able to use your knowledge of marijuana to make purchases of the products you want to consumer: buds, vaping oils, edibles, drinks and topical creams. Our Tour Guides are experienced with all forms of cannabis consumption. We understand first time users can have a variety of experiences, especially if they eat too many consumables! By learning about the entire marijuana production process, our Guests are better informed, make better choices and have better first time experiences as they explore their cannabis desires! Not only that, it's FUN to explore being Canna-Curious with a group of friends, or even a bunch of strangers who will become your friends! So, are you Canna-Curious? Come find out the answers to your questions with Happy Travelers Tours ... yes, it's OK to Exhale! Are you looking for an introduction to California Cannabis Culture? What better way than to enjoy a California weed tour or 420 friendly hotels? California has recently legalized marijuana. Now, the legal cannabis industry in California does not have to be a secret to you any longer! Join us as we look at California's new legal cannabis industry with our “Weed-and-Wine” Tour. With regard to 420 friendly Hotels, smoking indoors is pretty much off the table everywhere in California, so if you want to celebrate recreational marijuana legalization in the Golden State, make sure you book a cannabis friendly hotel room with a balcony—just don’t tell anyone we told you. Other 420 friendly places to stay besides hotels are AirBnB's and Resorts. Smoking marijuana is legal on private property; sometimes all you have to do is ask! Whether you're looking for a Party Bus Tours, Wine Tours or Educational Cannabis Tours, the options in California keep growing! Check out Happy Travelers Tours here! 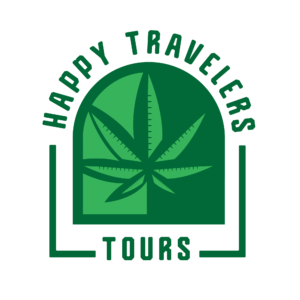 Come join Happy Travelers Tours as we follow the entire cannabis supply-chain from “seed-to-sale” on our unique Wine and Weed Tour of Sonoma County’s Valley of the Moon. On this tour we will stop at legal, licensed, production grows to see marijuana plants in various stages of growth. This is the first step in the marijuana production supply-chain. Then we travel to a Testing Laboratory, which is a critical step in the cannabis distribution-chain process. At the Testing Lab we will see how they certify the weed’s strength, purity and THC-rating. A marijuana production supply-chain tour wouldn’t be complete without a stop at a Retailer and the Happy Travelers Wine and Weed Tour includes a stop at a retailer who specializes in both medicinal and recreational cannabis sales. Sign up now to take part in our unique educational cannabis experience featuring California’s beautiful Valley of the Moon! Management Note: This Tour has been discontinued as of 1/1/19. California wine country bike tours are extremely popular, and for good reason. The landscape is wonderful and the rides typically take riders through some beautiful places, including the Valley of the Moon. Next time you're considering wine country bike tours, you might also want to consider a Wine and Weed Tour as part of your excursion. If you search for "bike tours near me" you'll see lots of results for Sonoma and Napa Counties. After you've spent a day riding through California Wine country, you might consider taking another run, but this time with stops at wineries and legal cannabis grows where you can learn more about what makes Wine (and Weed) Country so special. Our "seed-to-sale" tour stops at Grow Sites, Manufacturers and Retail Dispensaries and provides you with a luxurious counter-point to your Biking Experience. At the end of our Tour, you'll be refreshed, educated and ready to jump on your bike for more (after grabbing something to cure your munchies)! Book your tour now! Are you coming to Wine Country? It's a big place! Are you looking for Wine Tours? Did you know wine country includes both Napa and Sonoma counties? In fact, when you tour wine country you might want to book a trip up the Napa Valley as well as one up the Sonoma Valley. If you're going to do wine country wine tours, and you want to do Sonoma County wine tours, you might consider the Wine and Weed Tour of the Valley of The Moon. By combining both the fruit of the vine and the bud of the vine in one tour, guests learn to appreciate the similarities in production, the affect of terroir on the final product and the varietals which are popular in 420 culture. So, remember: Wine Country is a big region in Northern California which includes Napa and Sonoma Counties (the "Heart" of Wine Country). This area is now also known as "Weed Country" and Happy Travelers Tours offers a wonderful experience of Sonoma County Weed Country - from "seed-to-sale". Book your tour today!